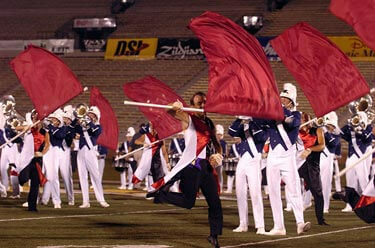 Drum corps experience: Bluecoats 2005, 2006 What is your favorite drum corps story? Finals night in 2005 – When I put my horn down on the last note, I got chills all over my entire body. It was the most amazing feeling. I don't normally cry in front of people, but hearing other people around me crying made me cry. It was one of the most emotional things I've ever done in my life. Bluecoats perform in Columbia, Mo., on June 24. What is your favorite moment in your show? The second movement during the 'dirt lick.' The drums are playing some chaotic beats, and we're running around with our elastic attached to our uniforms. What made you choose the Bluecoats? I didn't know what drum corps was, and so my band director told me to attend a camp in Austin for the experience. I went, and that was my first exposure to drum corps. What do you miss most from home? My bed and my computer. Any chance we get, any free day, I try to find a computer. What were you most looking forward to before tour? Has it lived up to your expectations? Finals night in 2006. I've always watched tapes of Madison finals all the years it's been there, and I can't wait to be a part of that. This year is my year. Anything else you want to say? Thank you to everybody who helped me be in drum corps, and I hope they liked the San Antonio show. This is my home show, so I hope they liked the performance tonight. And thank you for everything.